Check out the new 2019 Kia Sorento. If you need a third row occasionally, it offers a smaller footprint. The 2019 Kia Sorento is now available as a seven-passenger SUV only, and now one of the smallest mid-size SUVs to offer standard three-row seating. The South Korean automaker hopes the added flexibility will attract buyers like grandparents who want a vehicle with a smaller footprint but like having the option to seat the occasional smaller passengers. Sorento competes in the competitive mid-size SUV category. In the 2018 J.D. Power APEAL study, Buick Enclave, Nissan Murano, Volkswagen Atlas, Jeep Grand Cherokee, Dodge Durango, and Kia Sorento scored well. 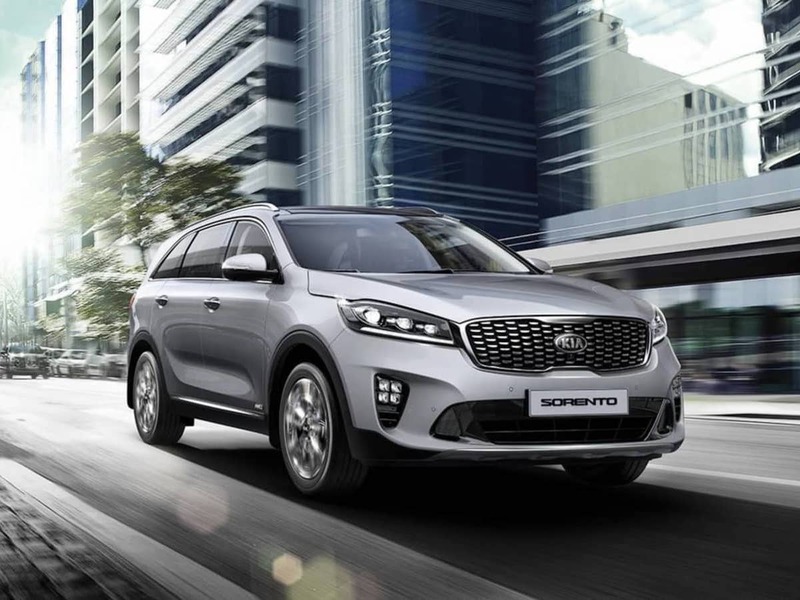 For 2019, Sorento gets a face-lift sporting a new grille, bumpers, and headlights and taillights. New full-LED headlights are standard on the SXL trim. The Sorento's 3.3-liter V6 is now standard on the EX, SX, and SXL. Kia has upgraded the V6's transmission to a new eight-speed automatic. Inside, Sorento is now available as a seven-passenger SUV only. 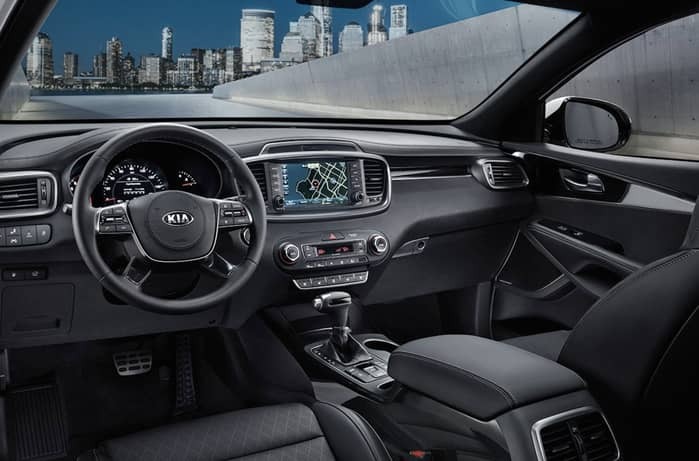 Sorento also gets a new steering wheel design, new interior accents, improved instrument panel graphics, and redesigned air vents and center console. The newly-redesigned 2019 Kia Sorento SXL ($46,490) comes standard with the V6 and includes upgraded steering, 19-inch wheels, LED running lights, upgraded exterior trim, automatic wipers, the panoramic sunroof, a 10-way power driver seat (with four-way lumbar adjustment), driver-seat memory settings, an 8-inch touchscreen, a navigation system, and a 10-speaker Infinity sound system. The SXL also comes with 19-inch chrome-clad wheels, upgraded Terracotta leather upholstery, heated second-row seats, a wood-trim steering wheel. It now comes with Kia's Advanced Driver Assistance Systems (ADAS) as standard equipment. ADAS is composed of a forward collision warning system, adaptive cruise control, blind-spot monitoring, rear cross-traffic alert, lane keeping assist and a surround-view camera system. All-wheel-drive models also get rollover mitigation as standard equipment. Kia Sorento should improve on its top safety ratings. Total MSRP including destination: $48,020. Inside, Sorento gets a fresh new look. This all-black tester cabin feels rich and offers a solid build quality. The dark interior can be brightened up significantly by opening up the massive panoramic sunroof above. The Sorento has one of the most attractive interiors in the class. We didn’t notice any difference in the front space with the added third row, but there is less space aft of the front seats. Adults can sit comfortably and slide the seats back, but there’s a noticeably less legroom. This would be an ideal vehicle for grandparents, who need the occasional second and third row for transporting smaller kids. This slightly smaller midsize Sorento SUV offers good practicality with its 50/50-split folding third row which lays flat and the 40/20/40-split second row is easy to configure. The power lift rear gate made it easy to load cargo this week. Our Sorento SXL AWD was equipped with the 3.3-liter V6 engine developing 290-hp and 252 lb-ft of torque. It comes mated with a new 8-speed automatic transmission transferring power to all four wheels. The 3.3-liter V6 gets an EPA estimated 19 /24 city/highway mpg and 21 combined mpg with all-wheel drive. The Sorento's 290-hp direct-injection V6 is a proven powerplant and Kia has it dialed in for maximum efficiency. The power delivery is smooth and mellow, and we thought it could use a bit more torque for pulling up the mountain. Up near Evergreen, Colorado, and 8300 feet elevation, it pulled the two-lane mountain roads with ease. There was plenty of power for passing and we didn’t want for more with it empty. With a full load of cargo and people, it could use a bit more. On the open road, it delivered readily. The new 8-speed automatic gearbox is smooth and a pleasure after driving so many CVTs. On the highway, handling is controlled, and the ride is smooth and quiet. We cranked up the Harman Hardon premium sound and sat back in the Nappa leather seats and enjoyed the ride. The Sorento feels solid and composed at high speeds. It’s not a sports SUV, but you will enjoy driving it as you transport the grandkids to the soccer game or swimming pool. There's a sufficient amount of sound insulation added to the Sorento, too. Only very coarse road surfaces were cause for elevated conversation volumes. Overall, we think the updates to the 2019 Kia Sorento are worthwhile and further improve this SUV's appealing mix of practicality and style. The SXL offers the latest safety tech and will keep families safe on the road. This vehicle has so much to offer for small families. Lots of space in the back rows with full tech on the driver side. The long journeys would not be boring.